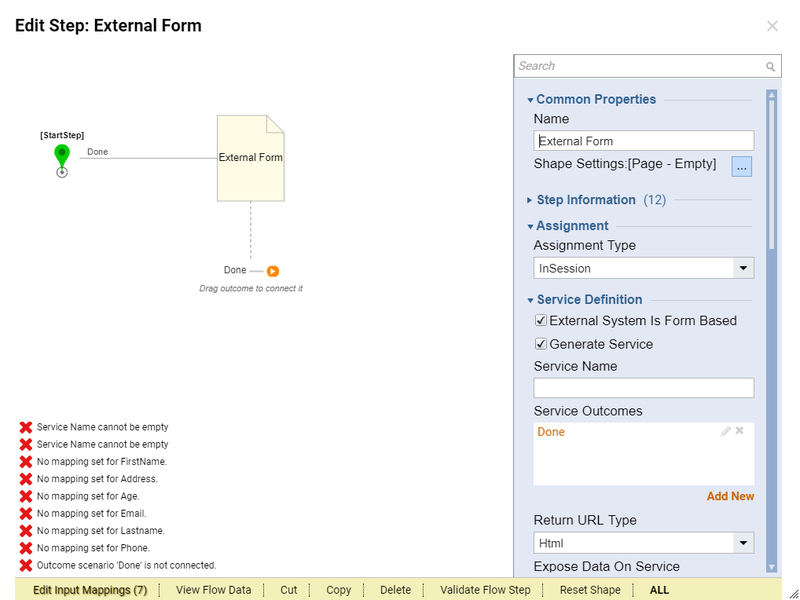 External Form	step was designed in Decisions to interact with forms using html methods or service calls. 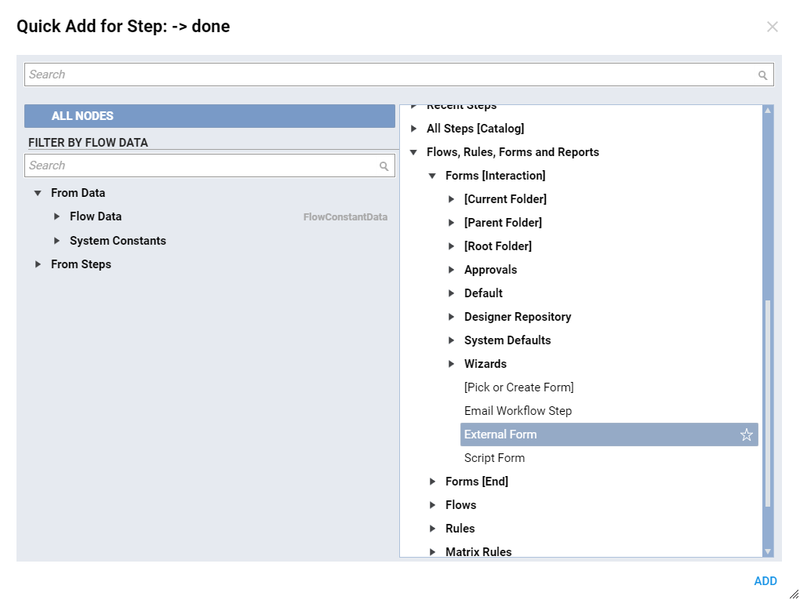 External Form	step could be found in the Flow Designer in the ToolBox under category. This method can also pass data into external form and retrieve data from the external form. 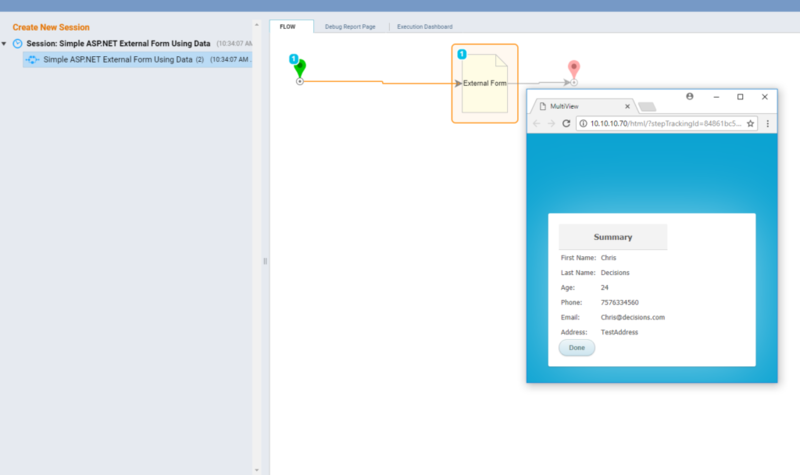 In this example we are going to pass data from Decisions to external ASP.NET web form using POST method, and display this data as Form&apos;s Labels. We begin with creating New Flow	in the Designer Folder. 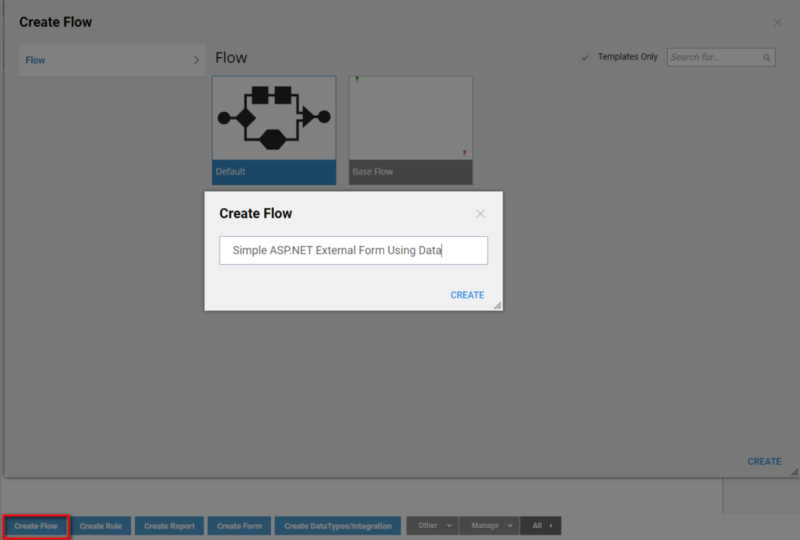 Next, we Name	our Flow and click Create	to proceed to the Flow Designer . In the Flow Designer start-up window we select External Form	step from Flows,Rules, Forms and Reports >	Forms[Interaction]	category. Click Add	to add it to our flow. 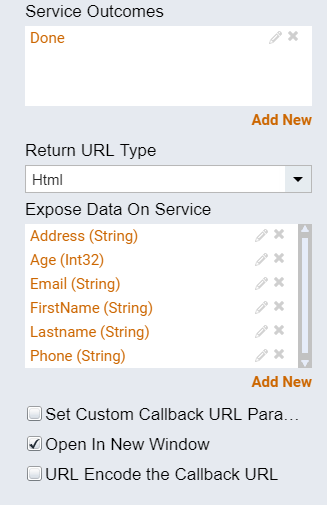 Next, we locate Url	options setup box in the ToolBox ... From Mapping Type	dropdown we choose Constant	and insert url to our external form into Value	field. 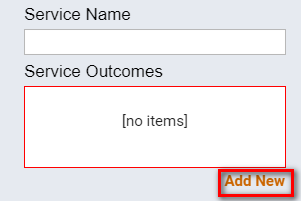 Next, under Service Definition	options for this step we locate Service Outcomes	box and click Add New	link to add new outcome from our External Form	step. In the resulting pop-up window we give our Outcome	name... For this example we are not expecting any data to be returned from the external form so we are not adding any Parameters . We click Ok	to save and close this pop-up window. 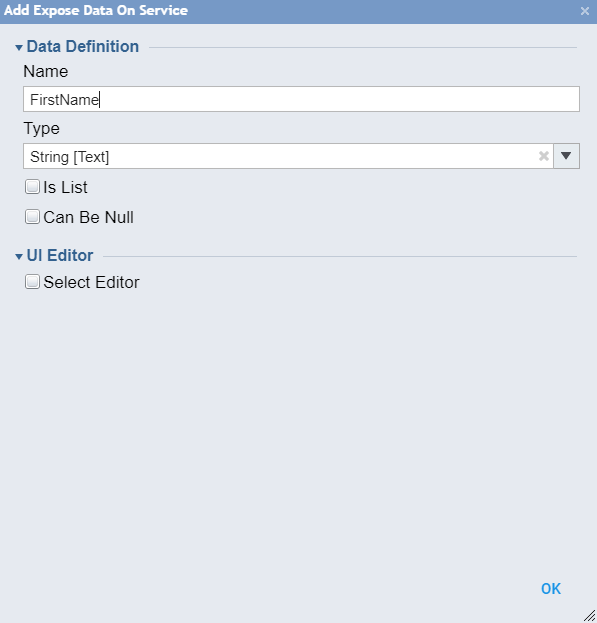 To send data to our form we need to populate our External Form	step with data we want to send. To do this we locate Expose Data On Service	box and click Add New	link to add new input Parameter . In the resulting pop-up window we provide the Name to our parameter and click Type	selector to define Type for our Parameter . Next we click Ok	to save and close Type picker and click Ok	again to save and close our Add Expose Data	On Service	window. The same way we add all Parameters that we want to send to our form. In this case all of them are String types except Age	which is an Integer Type . We can connect our steps now in the workspace. Next, from our External Form&apos;s options we choose Show Mapping Editor	to populate our Parameters with actual data we want to send to the external form. In the Mapping Editor we choose Constant	type of input for all our Parameters . 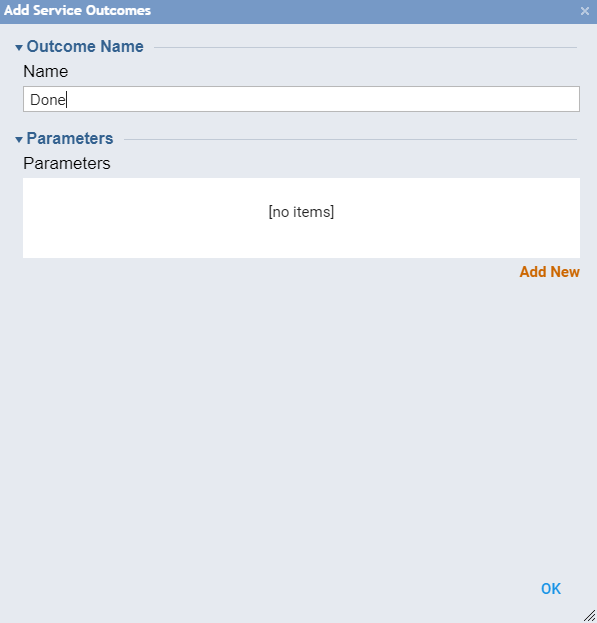 Next, we can populate our Parameters with the desirable Values to send to our External Form ... When we finish we click Ok	to save and close Mapping Editor	. Mention that we can view all information about ourExternal Form	step. This information is about how our Flow step can interact with the external form. To view this information choose View Integration Detail	from the External Form Options . The page with detail information opens in a new window. This completes our flow. 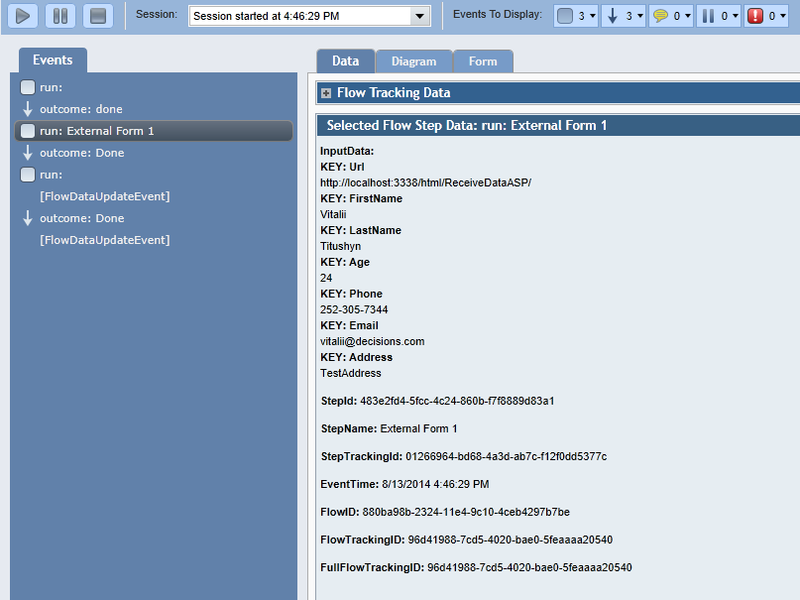 We can click Debug Flow	link from the top panel of the Flow Designer to test our flow. Our form opens in a new window and it is populated with the information that we had sent to it. 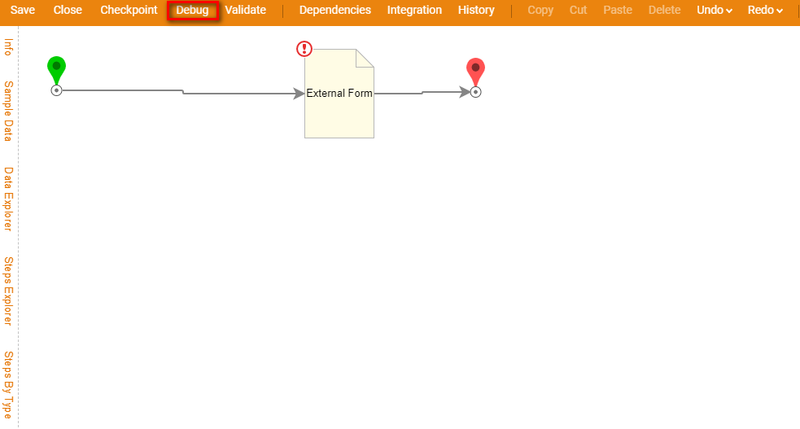 In the debugger we can see that flow ran with no errors. Additionally, we can check what data was sent to the form under Data	tab in the debugger.